In the intimate confines of the Luther W. Brady Art Gallery exhibition, Decenter NY/DC, there are thirty-nine works of visual and media arts that hold a story remarking on and celebrating the revolutionary 1913 Armory Show. Each work is tied to an artist and to a name. However, there is one piece of artwork that goes beyond a single artist and name. 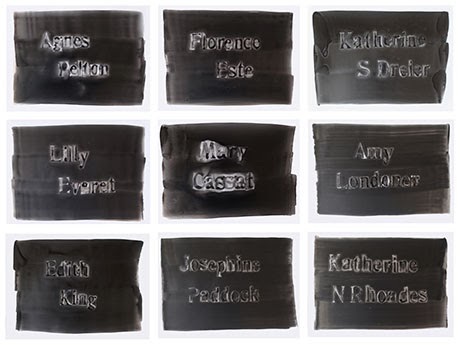 Andrea Geyer’s piece “Indelible” (1913-2013) writes a history through names. “Indelible” consists of fifty ink drawings, each expressing one name belonging to a leader, an activist, and most importantly, to a woman. The aim of Geyer’s work is to historically investigate evolving concepts such as gender in relation to the re-adjustment of cultural meanings in current politics. [i] During the original Armory Show, fifty women participated as artists and donors, making up one sixth of the show. Yet, why do the names of these women seem like lost memories? Notably, Katherine S. Drier, who acted as a patron and artist in the original Armory Show, established the Société Anonyme, which sponsored lectures, publications, and exhibitions of modern art for both the rich and poor American public. Additionally, American painter and printmaker Mary Cassat sponsored other Impressionist artists while also encouraging the wealthy to purchase artwork. Lastly, American painter Edith King exhibited five watercolor paintings during the original Armory show. 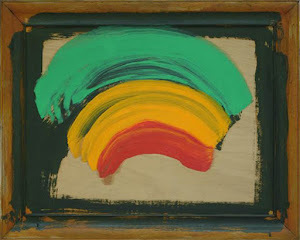 King’s paintings are clear examples of the modernism or “new art” that was celebrated during the period. Specifically, the paintings didactically transitioned to a presentation of more intimate landscapes of nature contrasting with the typical displays of extensive and atmospheric form. Undoubtedly, the female leaders of Geyer’s piece forged the beginnings of the feminist art movement. Their actions showed the public that women could serve in the art world beyond passive observers, instead acting as buyers, administrators, and artists themselves. Current artists who belong to the feminist branch of art such as Jenny Holzer, Barbara Kruger, and Cindy Sherman are similarly trying to challenge and incite with their artwork like their predecessors did. However, these artists freely participate in the current discourse because of the actions made by women like Cassat, Drier, and King. Female artists still face struggles expressing their ideas and proving their legitimacy, yet the actions of females during the 1913 Armory Show have assisted in overcoming the initial barriers that these artists may have faced otherwise. Therefore, significant progress has been made, yet work still must be done for female artists to obtain equal validity. Yet, there is an absent sense of gratitude for the actions of the fifty female artists, who participated in the original show, which Geyer explores in “Indelible”. As time has passed since the first Armory Show, the issues and ideas of the feminist arts movement have developed and changed. The actions of the first women who participated are still relevant, but are discussed secondarily to the prevalent issues of today. Geyer attempts to remedy this disconnect in her piece by celebrating these artists through a modern context and outlet. French philosopher Albert Camus once discerned and stated, “Art is matter infused with spirit”. Thus, art is a vessel that is subject to protection from impermanence: it is essentially a mark that cannot be removed in time. It is indelible. The purpose of Geyer’s piece is to embody the fifty participating women of the 1913 Armory Show. The names of these women hold great significance, yet have been easily forgotten over the course of the feminist movement. Their actions, however, have left an irremovable mark on history and for all female artists. Geyer’s work is not simply a celebration of these women, but a vessel forever holding the spirit of Agnes Pelton, Florence Este, Katherine S. Drier, Lily Everet, Mary Cassat, Amy Londoner, Edith King, Josephine Paddock, and Katherine N, Rhondes, to name a few. Ultimately, Geyer’s Indelible continues the traditions of the original Armory Show by voicing “new art” through the ideals and histories of her past predecessors. Andrea Geyer, Indelible, 1913-2013. Sumi ink on Denril, 15.5 x 20 inches. [i] "Andrea Geyer." Parsons New School of Design. N.p., n.d. Web. 29 Oct. 2013. [ii] "'The Part Played By Women.'" The Gender of Modernism at the Armory Show. N.p., n.d. Web. 29 Oct. 2013. [iii] Schapiro, Meyer. Modern Art, 19th & 20th Centuries (Selected Papers). N.p. : n.p., 1952. Print. Can DC Art Really be Local?